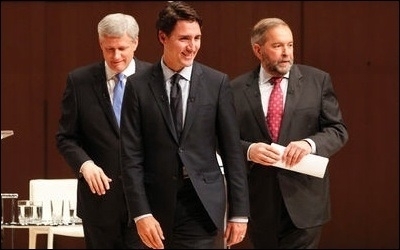 Prime Minister Stephen Harper (left), Liberal leader Justin Trudeau (center), and NDP leader Tom Mulcair leave the stage following the Munk Debate on Canada's foreign policy in Toronto on September 28. At the vigorous foreign affairs debate between the major Canadian national party leaders at the Munk Centre Monday night, one subject was conspicuous by its absence — Saudi Arabia. A week earlier, during the French-language debate, when prodded by Bloc Quebecois Leader Gilles Duceppe to explain why Canada was arming a country that many political and military strategists consider our enemy, Prime Minister Stephen Harper sheepishly claimed, "Saudi Arabia is our ally." That remark was met by a sarcastic rebuke from Duceppe, who shot back, "So Saudi Arabia is your ally. Oh good, I've taken note." Harper's explanation is cause for concern. He could have said, "in trade sometimes one has to deal with the devil," or that, "we traded with the USSR as well," but he stuck to his "ally" rhetoric. Defending Canada's $15 billion military deal with Saudi Arabia to supply light armoured vehicles, Harper told reporters, "This is a deal, frankly, with a country (that), notwithstanding its human rights violations, which are significant ... is an ally in the fight against the Islamic State." Saudi Arabia is not our ally in the fight against Islamic State. In fact, Saudi Arabia is not our ally in the fight against Islamic State. Indeed, it would not be an exaggeration to say, Saudi Arabia is, metaphorically speaking, the ultimate "Islamic State." 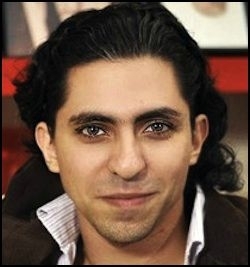 As early as 2002, Laurent Murawiec, the late French-born geostrategist with the Rand Corporation, warned an advisory committee to the United States Department of Defence that the "Saudis are active at every level of the terror chain, from planners to financiers, from cadre to foot soldier, from ideologist to cheerleader ... Saudi Arabia supports our enemies and attacks our allies." Murawiec resigned from his job at Rand shortly after. While he insisted at the time he wasn't fired, many suspected the parting was an example of the lobbying power of the Saudis in the George W. Bush administration, one that continues with President Barack Obama today. To my astonishment, neither Liberal Leader Justin Trudeau nor NDP Leader Thomas Mulcair were willing to criticize the Saudi government or promise to tear up the deal with the Saudis. Perhaps they were not well briefed on the subject when it first came up, I thought, so I waited for the Munk foreign affairs debate on Monday for the subject to emerge. It didn't. Neither the moderator nor the leaders themselves brought up the subject of Saudi Arabia, the arms sale, the case of political prisoner Raif Badawi, whose wife, Ensaf Haider, is now a resident in Canada, or anything critical of the Saudi kingdom. There is something clearly wrong when no Canadian leader dares to censure Saudi Arabia. Instead, we witnessed Trudeau mounting an unabashed defence of the rights of convicted Islamic terrorists to hold on to their Canadian citizenship; jihadis who share the same political worldview propagated by many in Saudi Arabia. Trudeau's self-righteous rant seemed to suggest revoking Canadian citizenship was a racist act against immigrants. Are you seriously saying, Mr. Trudeau, we should never be able to revoke citizenship from somebody? We revoke the citizenship already of war criminals, and why would we not revoke the citizenship of people convicted of terrorist offences against this country? There is something clearly wrong with Canadian politics when no leader dares to censure Saudi Arabia, let alone call for sanctions against it. Where are the Bernie Sanders and Donald Trumps of Canadian politics? How long will we have to suffer the mediocrity in Canada of puppeteer consultants, Teleprompters, contrived rage and fake self-righteousness?